The Verve's reunion has come to an end, according to reports, with the band's Nick McCabe and Simon Jones forming a new band, The Black Ships. 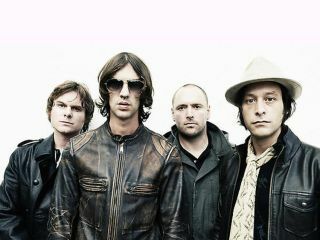 In a post on his MySpace blog, guitarist McCabe told fans: "The Verve seems to be on holiday and shows no sign of not being on holiday. I've been hesitant to breach Official Secrets-style policy with any missives from the, well, from any front, basically. Don't ask me anything about the big V". A source claiming to be close to the band has told The Mirror newspaper: "As far as Nick and Simon are concerned The Verve no longer exists. They think Richard was just using the reunion as a vehicle to get his solo career on track. Oh dear. The Verve reunited for 2008's Forth album and played a triumphant Glastonbury headline slot but tensions between singer Ashcroft and McCabe in particular seem never far from the surface. MCabe has now left the band three times over the years. Hear The Black Ships here. McCabe says: "Expect krautrock style excursions into the unknown and maybe, just maybe, the killer pop record we're toying with making… There is a huge amount of material being generated and we have several interesting vocalists in mind. Clips to follow."